I'll admit it-- I go through phases of craving a good dose of greens, BUT sometimes eating a plain ol' salad just doesn't sound good. I do however know how much my body needs those greens, so I have to have something fabulous to be able to create when I'm in a non-salad eating funk! 😉 One of my absolute favorite salads is from Veggie Grill, I actually crave this salad all the time, so I did my best to recreate in the most simple way and it's the simplest answer to getting my greens down and actually looking forward to it! 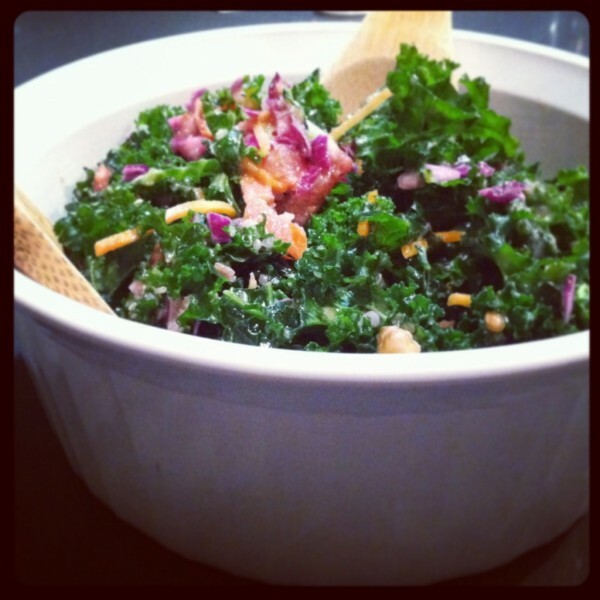 This Kale salad is full of nutrients that will give your whole body a boost! *I used a Gluten Free Papaya Seed Dressing that I found, because that tasted the most like Veggie Grill’s salad, but you can easily just add some more lemon juice and fresh ground pepper & sea salt and that would be a healthy dressing and taste really zesty! Remember, if you’re serving this to allergy sensitive people, like gluten free or dairy free, make sure you check your store bought dressings before serving, I always live the dressing on the side so people can read the ingredients and use the amount that is good for them. Remember when you’re shopping for dressings you want to stay clear of refined sugars and super sugar packed and creamy dressings.